I AM CENTERED, I AM BALANCED, I AM AT PEACE. - pink zebra jasper is used to connect us to the grounding energy of the Earth and loving energy of the Universe, helping to overcome stress and anxiety. 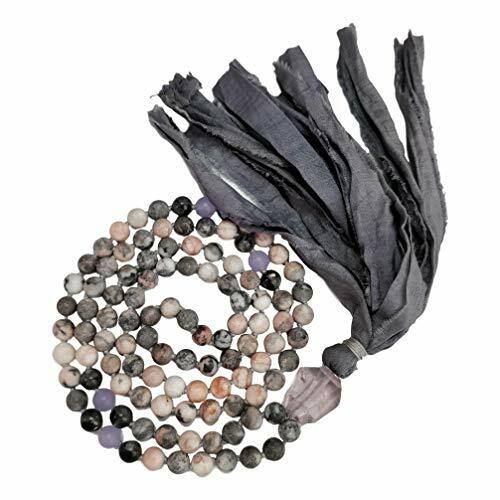 108 8MM REAL STONE BEADS - real stones provide a nice weight to your mala bead necklace which is such a treat for the hands during meditation. AMETHYST GURU BEAD - a protective crystal that purifies the mind and clears it of negative thoughts, including negativity and anxiety. SARI SILK TASSEL - your sari silk tassel is gorgeous, unique, full and fun. EACH MALA IS UNIQUE - due to the natural materials, each mala will vary slightly in appearance. For example, your amethyst crystal might be a lighter or darker purple than pictured.